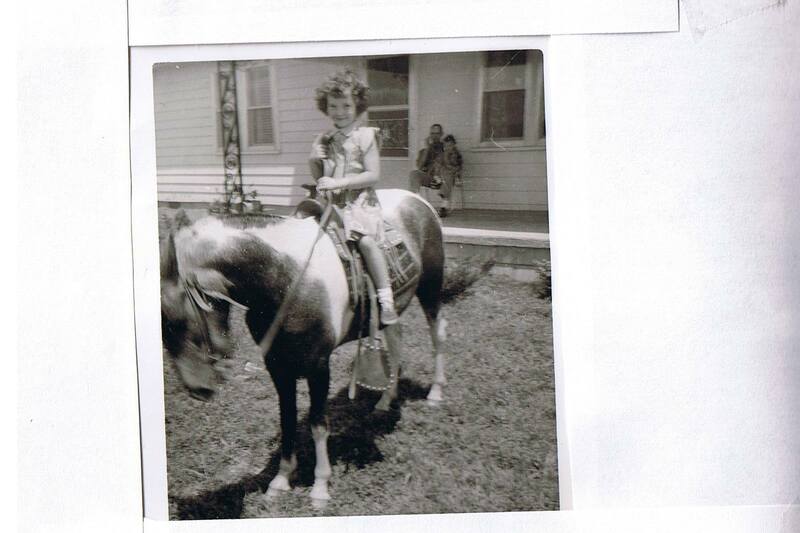 Once upon a time, a long time ago, my dad got us kids (well, me) (my brother had a quarter horse) a pony. If you know anything at all about the equine world, you know that ponies are mean little you-know-whats and stubborn. My dad had a sense of humor, and I can only imagine he bought this pony so he could laugh his buhiney off at the things it did to me. That’s him sitting on the porch with my little sister on his lap, getting ready for a big guffaw no doubt. I was six or seven in this picture. Back then kids had more freedom to move about and play, and were allowed to do all sorts of dangerous (in the eyes of today’s world) activities. We didn’t have Wii or other games like that, and television wasn’t nearly as interesting as going exploring or playing with friends. Today, kids think it’s dangerous to walk or ride their bike down the street, even in our little rural town (one of the effects of instant news). And truthfully, I would have a cow if my grandgirls did half what I did when I was growing up. My dad had a small farm about a mile or a little more out of town. Down the dirt road to the north from our house, past the horse show arena, on out toward pee curve, turn to the west and go up a sloping, steep hill (especially on a bicycle in the hot summer), then breeze on down the other side to the farm. We had a great time on that place. That’s where Mom had her garden, where Dad had animals of all sorts through the years, and where the barn with the horses was. Some days I would drive out to the farm with Dad (back then we could sit in the truck bed) and ride Old Bill. This particular day I was going to ride him back into town to the house, following Dad’s truck. We did just fine till we got to the top of that steep hill. It was summer, and I guess Old Bill just didn’t like to be pushed that hard. We were in the part of the road that had shade trees on either side, and Dad’s truck was waaaaaay down the road turning pee curve to head on to the house. He was gone. And I have to admit, I felt just a bit more than a smidgen of panic. I don’t know if Old Bill sensed I was scared to be there all by myself or if he had it planned the minute he saw Dad’s truck make the curve, but he started to lie down in the road… with me on him. I pulled on the reins and kicked the fat, stubborn thing with all my little years had in me to no avail. It was either jump or get squashed. So I jumped off just as he did the full lie-down. Oh, I got Old Bill to the house. I led him the rest of the way home. Every time I tried to get back on him, he would lie down in the road. As soon as I quit, he got up and would start plodding along. I know I couldn’t have felt any heavier than a mosquito on his back. By the time we got home, I was spitting mad… at Old Bill, at Dad, and at me for my inability to control that stubborn pony. Now, though, I give myself a little credit. I suppose at the age of 7 or 8 that I had some control… or he would have bucked me off and ran away. But that’s another Old Bill tale. Oh that’s so funny. Learning to deal with a stubborn old pony is not easy task. I asked my granddaughter this morning who that was in the picture, and she said, “Me.” Just checking to see if what I thought was true — that she looks just like me when I was small. Oh Brenda wat a cute story finally figured out how to comment on my phone I just love all your stories Glad to know someone else collects a zillion recipes and procrastinates on the cookin part lol Keep up the good writing !!!!!! Loved your blog Brenda…….rem. the route to your dad’s farm well ! And riding in the back of your dad’s pickup……and the dust!As for riding ponies,that was Terry’s “thing”.I was always(and still am)the “scaredy-cat” of the bunch! I loved your card. It made my day! I’m glad we were lucky to have two great pony mares. They were angels! Thank you. I don’t ride anymore, at least not for ten or eleven years now. But growing up we were in horse shows and rode all the time. I love your site, by the way! That’s too funny. I don’t remember how long we had Old Bill, but long enough for him to treat me bad! I remember sitting on that pony in the pen by your house when I was a little kid! He probably didn’t buck you off, did he? Nooooo, saved all that stuff for me!